Entropy is another important aspect of thermodynamics. Enthalpy has something to do with the energetic content of a system or a molecule. Entropy has something to do with how that energy is stored. We sometimes speak of the energy in a system as being "partitioned" or divided into various "states". How this energy is divided up is the concern of entropy. By way of analogy, picture a set of mailboxes. You may have a wall of them in your dormitory or your apartment building. The mailboxes are of several different sizes: maybe there are a few rows of small ones, a couple of rows of medium sized ones, and a row of big mailboxes on the bottom. Instead of putting mail in these boxes, we're going to use them to hold little packages of energy. Later on, you might take the energy packages out of your own mailbox and use them to take a trip to the mall or the gym. But how does the mail get to your mailbox in the first place? The energy packages don't arrive in your molecular dormitory with addresses on them. The packages come in different sizes, because they contain different amounts of energy, but other than that there is no identifying information on them. Some of the packages don't fit into some of the mailboxes, because some of the packages are too big and some of the mailboxes are smaller than the others. The energy packages need to go into mailboxes that they will fit into. Still, there are an awful lot of mailboxes that most of the energy packages could still fit into. There needs to be some system of deciding where to put all of these packages. It turns out that, in the molecular world, there is such a system, and it follows a pretty simple rule. When a whole pile of energy packages arrive, the postmaster does her best to put one package into every mailbox. Then, when every mailbox has one, she starts putting a second one into each box, and so on. It didn't have to be that way. It could have been the case that all the energy was simply put into the first couple of mailboxes and the rest were left empty. In other words, the rule could have been that all the energy must be sorted into the same place, instead of being spread around. But that's not how it is. Energy is always partitioned into the maximum number of states possible. Entropy is the sorting of energy into different modes or states. When energy is partitioned or sorted into additional states, entropy is said to increase. When energy is bundled into a smaller number of states, entropy is said to decrease. Nature's bias is towards an increase in entropy. This is a fundamental law of the universe; there is no reason that can be used to explain why nature prefers high entropy to low entropy. Instead, increasing entropy is itself the basic reason for a wide range of things that happen in the universe. Entropy is popularly described in terms of "disorder". That can be a useful idea, although it doesn't really describe what is happening energetically. A better picture of entropy can be built by looking at how a goup of molecules might sort some energy that is added to them. In other words, what are some examples of "states" in which energy can be sorted? If you get more energy -- maybe by eating breakfast -- one of the immediate benefits is being able to increase your physical activity. You have more energy to move around, to run, to jump. A similar situation is true with molecules. Molecules have a variety of ways in which they can move, if they are given some energy. 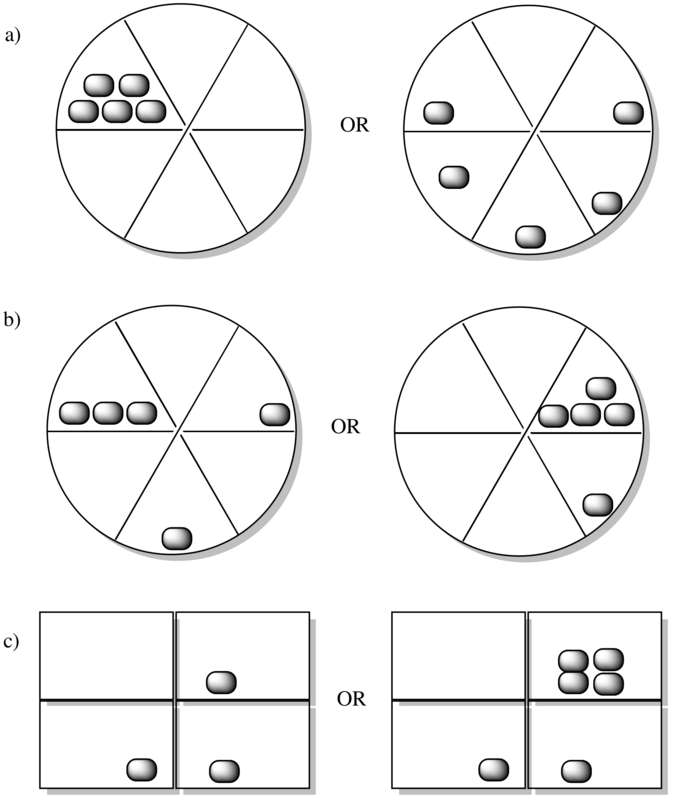 They can zip around; this kind of motion is usually called translation. They can tumble and roll; this kind of motion is referred to as rotation. 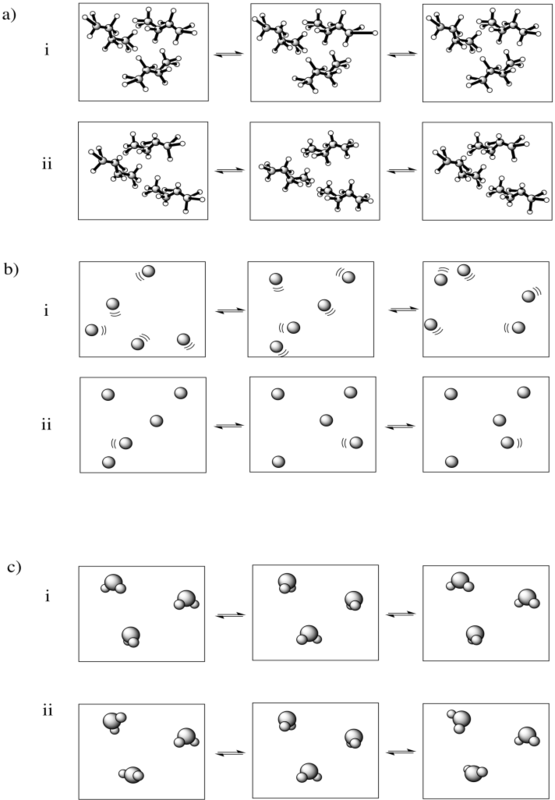 Also, they can wiggle, letting their bonds get longer and shorter by moving individual atoms around a little bit. This type of motion is called vibration. When molecules absorb extra energy, they may be able to sort the energy into rotational, vibrational and translational states. This only works with energy packages of a certain size; other packages would be sorted into other kinds of states. However, these are just a few examples of what we mean by states. OK, so energy is stored in states, and it is sorted into the maximum possible number of states. But how does entropy change in a reaction? We know that enthalpy may change by breaking or forming certain bonds, but how does the energy get sorted again? The changes in internal entropy during a reaction are often very small. In other words, the energy remaining at the end of the reaction gets sorted more or less the way it was before the reaction. However, there are some very common exceptions. The most common case in which internal entropy changes a lot is when the number of molecules involved changes between the start of the reaction and the end of the reaction. Maybe two molecules react together to form one, new molecule. Maybe one molecule splits apart to make two, new molecules. If one molecule splits apart in the reaction, entropy generally increases. Two molecules can rotate, vibrate and translate (or tumble, wiggle and zip around) independently of each other. That means the number of states available for partitioning energy increases when one molecule splits into two. Entropy generally increases when a reaction produces more molecules than it started with. Entropy generally decreases when a reaction produces fewer molecules than it started with. Apart from a factor like a change in the number of molecules involved, internal entropy changes are often fairly subtle. They are not as easy to predict as enthalpy changes. Nevertheless, there may sometimes be a trade-off between enthalpy and entropy. If a reaction splits a molecule into two, it seems likely that an increase in enthalpy will be involved, so that the bond that held the two pieces together can be broken. That's not favourable. However, when that happens, we've just seen that there will be an increase in entropy, because energy can then be sorted into additional modes in the two, independent molecules. So we have two different factors to balance. There is a tool we often use to decide which factor wins out. It's called free energy, and we will look at it next. 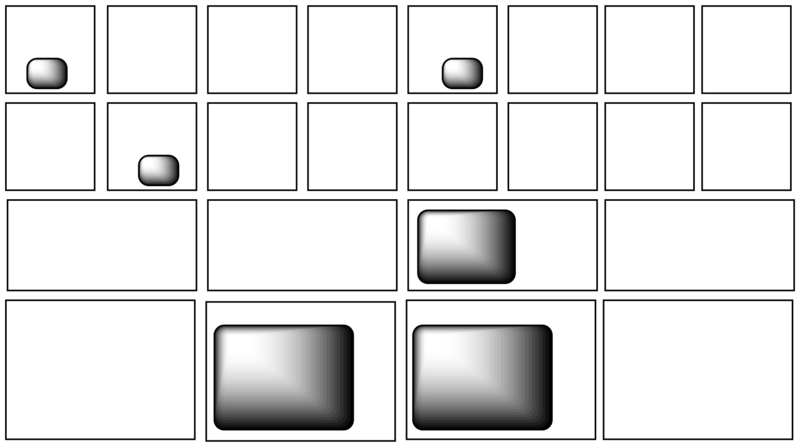 In each of the following pairs, look at the distribution of energy packages (gray shapes) and decide which system has the highest entropy. In each of the following pairs, select the system (i or ii) that has the highest entropy. Based on what you know, would the following reactions be entropically favoured or not? a) The decarboxylation of one molecule of the anti-Parkinson's drug, L-DOPA, to produce one molecule of carbon dioxide and one molecule of the neurotransmitter, dopamine. b) One molecule of nitrogen and three molecules of hydrogen react to produce two molecules of ammonia? c) One molecule of methane reacts with two molecules of oxygen to produce two molecules of water and one molecule of carbon dioxide?